Harold Cunningham did whatever it took to make his Baylor education possible, earning scholarships and working full time to make ends meet during his college years. Ann Peebles Cunningham sang in glee club, the Baylor Bards and Rhapsody in White, was an Athenean, and on the Memorial Dormitory Council. But the two didn’t meet until months after graduating when they landed in the same church in Corpus Christi, Texas. After Baylor, Harold went to work for Arthur Andersen where he enjoyed a long and successful career. During that time, Harold jumped at the chance to recruit well-trained Baylor accounting students to the company and made recruiting visits twice a year for 40 years. Ann utilized the musical talents she honed at Baylor to serve public school students and the church for three decades. When Harold retired from Arthur Andersen in 1996, the Cunninghams returned to Waco and began a long period of active involvement with the university. Harold recalls fondly the time spent as a student with Dr. Emerson Henke and took to heart his professor’s charge to seniors to consistently give back to Baylor however they could. Mindful of this commitment to his alma mater, Harold served Baylor in a variety of leadership capacities from 1997-2011, becoming Baylor’s chief financial officer, vice president for finance and administration, vice president of special projects, Baylor Regent, Regent Chairman, and acting president. He has been deeply involved in charting the course for Baylor’s future, making his and Ann’s beloved Baylor even better for their own grandchildren and generations of future students. The Cunninghams have played key roles in countless Baylor projects, from reacquiring the grounds of Baylor at Independence, helping fund Ferrell Center locker rooms, the swimming pool at the McLane Student Life Center, and upgrades at Baylor Ballpark, to supporting excellence funds across Baylor athletics and establishing multiple endowed scholarships. 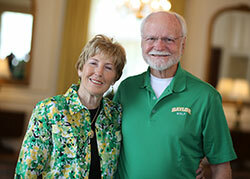 From leading the institution, to helping a single student, Harold and Ann Cunningham have given their all for Baylor. Honoring unusually significant service and contributions to the life and future of the University, the Founders Medal is awarded to Harold and Ann Cunningham.